Thank you to Monica McGurk for sponsoring this post. Learn more about Monica and her books here. A while ago, I reviewed Dark Hope, the first book in the Archangel Prophecies Series by Monica McGurk. I am really excited to now review the second installment in the Trilogy: Dark Rising. Read my review of Dark Hope here: Dark Hope Book Review. 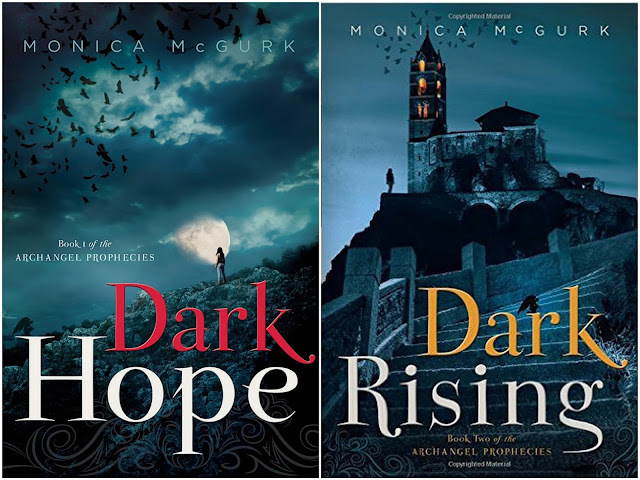 Dark Hope ended with a surprising revelation about Hope's identity and the beginning of a new adventure, so I was eager to get into the story again to find out what happened! The book started a little bit slow but at the same time jumped right into the conflict from the end of the first installment. I especially enjoyed the way McGurk is able to really transport you into other places. She is very skilled at painting the picture and helping the reader see in detail where the characters are. In the first book it was places I was familiar with, like Las Vegas and Snow Canyon. In this second book it was places I have never visited, like Turkey and Ireland, yet I felt like I was there. One of Monica McGurk's passions is educating people about human trafficking. I was so impressed with her ability to focus on such a real and gritty subject in a book that is solidly in the fantasy genre. The human trafficking issues were less prominent in this book, but were still woven into the thread of the story expertly. I appreciate the passion the author has for this issue and I have learned so much about it simply from reading these two books. What an excellent way to spread awareness on an issue that most teenage girls have absolutely no knowledge of! Hope's character continued to be a strong female character that I would not mind my daughters reading about. I didn't always love her choices, but she does learn some lessons the hard way and I definitely shed more than a few tears as I followed her on her adventures. And now I must wait for the third and final installment, which is coming out later this year. But while I'm waiting, you should definitely start reading!